The Olsen Haus Ankle Boot is fashionably vegan (and an exclusive, limited-edition collaboration between Vickerey and Olsen Haus). 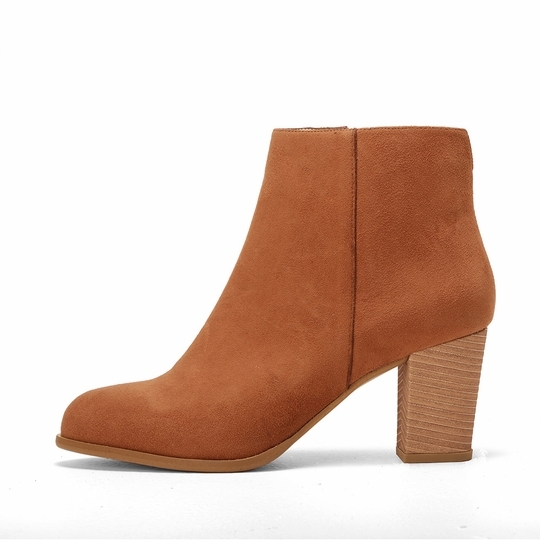 The camel color and three inch stacked heel give it a bit of a seventies vibe, while the clean lines keep it feeling modern, too. We love the tone-on-tone zipper, exterior side seam, and v-cutout at the back of the ankle. These are great with boot-cut jeans, leggings, or tights and a skirt. Olsenhaus was founded in 2008 by Elizabeth Olsen, an outspoken advocate against the use of animals for food, clothing, experimentation and entertainment. Her mission was to merge her passion for design, fashion and function with her advocacy for animals, the environment, and transparency in business without sacrificing luxury or style of fashion. All products are sustainable and purely vegan. A portion of proceeds from Olsenhaus are donated to numerous animal rights organizations throughout the country. Elizabeth is an active supporter - encouraging new retailers to carry her brand, but more importantly, her passionate message. She inspires design students to use sustainable, cruelty/animal free materials in their collections, hoping to motivate and transform the fashion world.